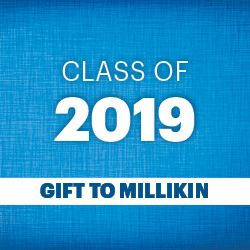 Class Gifts provide a chance for each graduating class to leave a legacy at Millikin before you turn in your final exam, walk across the stage at commencement, and bid a fond farewell to your undergraduate career. Fundraising for the four upcoming graduating classes is ongoing, so make a gift (or two, or four) to your class fund at any time throughout your time as a student. Each class has a goal of raising a total of $5,000 by their respective commencement ceremony. The Class Gift itself will be determined by online vote during the spring semester of your junior year. No matter the size of your contribution, the Class Gift is special because it is for students, from students. Give today to your Class Gift! Parents: Want to make a gift on behalf of your student? Your student will receive the honors listed above during senior year. To designate the gift correctly, please indicate that the gift is on behalf of your student on the online giving form. Use your student’s full legal name. 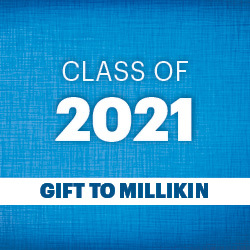 Millikin students have participated in funding a variety of Class Gifts that have made a lasting impact on our campus for fellow and future students. Questions? 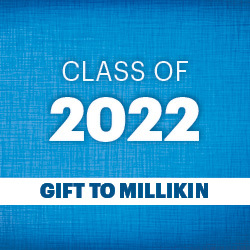 Please contact Alyse Knust, senior director of alumni engagement at aknust@millikin.edu or 217.424.6383.